Each of them has its own advantages and disadvantages and normally your dental surgeon will choose the best option to replace your missing teeth based on your oral condition. – Restore esthetic and speech quality. – Thus improve and restore patient’s quality of life. 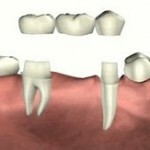 You can read http://www.intelligentdental.com/2011/08/10/alternatives-to-partial-dentures/ for other alternatives to replace missing teeth. – Dental bridges are easier to accept by patient compared to removable partial denture as they resemble the anatomy of natural teeth thus giving patient the feeling of having natural teeth. – Dental bridges are easier to maintain compared to removable partial denture because removable partial denture involves larger denture bearing area (your oral tissues) thus having more problems. – Read here for more information regarding problems arise from wearing removable partial denture. Although dental bridges interfere less with plaque removal, but good oral hygiene from patient is necessary to prolong its life span. – Dental bridges have longer life span compared to removable partial denture .Removable partial denture last around 10 years where as conventional bridges last around 20 -40 years but repair process for removable partial denture is easier to carry out . – Dental bridges can also mask the ugly appearance of adjacent teeth which is destroyed by caries, or discoloration due to endodontic treatment. – Not indicated for long edentulous span and to replace multiple loss teeth. 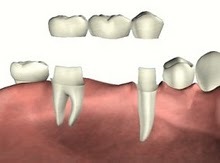 – Difficult to repair/modify and construction of dental bridge is very technically sensitive . Failure might require a reconstruction thus require more cost and clinical appointments. – – More costly compared to removable partial denture. Might be a burden for patients that are financially challenged. – Used when edentulous space is large. Dental bridge is not suitable to replace large edentulous space because Ante’s law stated that for a dental bridge to be stable and last long, the root surface of the adjacent teeth (which are used to support the dental bridge) should be larger than the space replaced. – They are cheaper initially but may require patient to pay more for repair procedures if there are more problems arise due to denture wearing. – As we have mentioned earlier, repair procedure and modification can be done easily compared to dental bridge thus easier to cope with future loss of teeth and bone resorption . – Construction of removable partial denture is less technically sensitive compared to fixed partial denture. – Removable partial denture can be removed during contact sports to prevent injuries and they are removable for cleaning purposes. -It is less stable and retentive compared to dental bridges as fixed partial denture are cemented/glued to its surface and cannot be removed unless it loses its retention. – It is less acceptable to certain patients. Wearing a removable partial denture might be difficult for some patients who have high gagging reflex. – Appearance of denture clasp can be unaesthetic. – High maintenance and frequent alteration of removable partial denture might be needed for certain cases. – Problems such as inflammation of oral tissues etc might occur due to prolonged wearing of denture and poor oral hygiene. Before deciding whether to replace your missing teeth with removable partial denture or dental bridge, you should discuss your oral condition with your dental surgeon in order to have your missing teeth replaced with a prosthesis which last long, improves your aesthetics, mastication, speech and quality of life.